Whether patients are seeking a low-tech approach or are in need of high-tech interventions such as genetic screening of embryos, our team of expert reproductive endocrinologists and clinical specialists can diagnose and effectively treat both rare and common cases of male and female factor infertility. RMA of New York also offers egg, sperm, and embryo freezing for both elective and medical indications, and has helped thousands of women, men, and couples preserve their reproductive options. Research breakthroughs and continuous improvement in laboratory processes and patient care protocols has led RMA of New York to be recognized as one of the top IVF centers in the world. RMA of New York provides expert quality care and serves patients as the Department of Reproductive Endocrinology and Infertility of the Mount Sinai Health System, an integrated system that includes seven hospital campuses and a top-ranked medical school. The Mount Sinai network includes 6,500+ primary and specialty care physicians, 2,000 residents and fellows, 12 free-standing ambulatory surgery centers, and averages 16,350 babies delivered each year. Mount Sinai Hospital is recognized as a Center of Excellence and ranks among the best hospitals in the region for Obstetrics and Gynecology in the U.S. News & World Report. 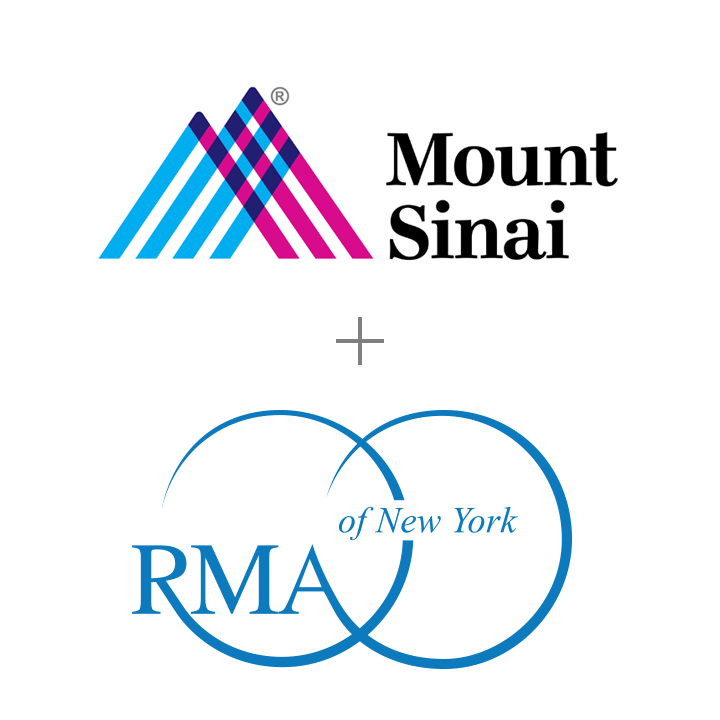 RMA of New York's physicians also serve on the faculty board as members of the Mount Sinai Icahn School of Medicine and are involved in extensive clinical research to further the science and technologies of reproductive medicine, including collaborating on studies with the Icahn Institute for Genomics and Multiscale Biology. Our team is actively working to advance methods of embryo sequencing to allow further insight in screening for genetic mutations and chromosomal abnormalities so that we can be sure our patients receive one healthy, screened embryo enabling successful gestation and the birth of one healthy baby. RMA of New York offers hope to those for whom IVF treatment has failed at other centers – our success rates mean that we consider patients with even the poorest of prognoses. View our success rates. At RMA of New York, we offer exceptional counseling, care, and treatment to help our patients achieve their family goals. Our core values demonstrate our commitment to patient health, happiness, and positive outcome. Our values of innovation, compassion, and success reflect our pledge to help couples and individuals achieve the family of their dreams. Innovation begins with taking a leading role in the science of reproductive medicine. Striving to develop new treatment protocols and taking an innovative approach to existing procedures to achieve the highest success rates for patients is always our priority. Simultaneously, RMA of New York’s expert team of clinical staff continues to learn and discover new ways to analyze big data to glean additional information that can continue to drive success rates upward. Compassion is reflected in all that RMA of New York does. Every patient’s circumstances are unique, and our mission is to support patients on the emotional journey through the assisted reproduction process, and to undertake the physical and emotional elements of the process. Our staff cares deeply about helping each one of our patients achieve their family goals, and is always compassionate and sensitive to the needs of each individual and couple. Success is the reason we do what we do. The drive for success motivates us to keep innovating and to remain at the forefront of fertility and reproductive medicine. RMA of New York offers hope to those for whom IVF treatment has failed at other centers – our success rates mean that we consider patients with even the poorest of prognoses. Commitment to improving reproductive outcomes by performing advanced research in laboratory processes, quality controls, data-driven protocols, and scientific discovery contributes to RMA of New York’s recognition as one of the top IVF centers in the world.